The Touch Drawing Gathering provides support and spaciousness to release day-to-day pressures and experience liminal sacred space. What a blessing this is: a time-out-of-time to settle into your soul and move through many dimensions of the Touch Drawing process. Participants share a passion for the transformative power of creative expression. Our focus unfolds through the week from personal exploration, to intuitive engagement with others, to a deepening relationship with the earth and spirit. Though Touch Drawing anchors the core of the experience, something more happens that cannot be described in words. Read below to get a better sense of what the Gathering is. You can also see a daily schedule and find answers to Frequently Asked Questions. 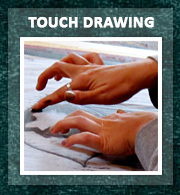 Touch Drawing rises from a deep, non-verbal place within. To help you relax and access the creative flow, Deborah guides simple movement and vocal toning practices. She also holds space while you draw with evocative vocal tones, along with a great ceremonial drum and crystal bowls. Reflective writing and non-invasive witnessing create bridges to the verbal mind and help you gain insight on your drawings. Movement practices encourage you to feel and embody your images. You will also mount your drawings on a firm surface and develop them with color in a range of mediums. This enhances their presence and your relationship with them. To balance the richness of group process, we enter a day of silence. This provides spaciousness for personal integration. You can wander the towering cedar and fir forest of the hundred-acre retreat center. Or if you feel adventuresome, join Deborah on an outing to South Whidbey State Park, where you can wander the old growth forest and make your way to the wild beach that faces the Olympic Mount ains. It is a time to rest, reflect & integrate the intensive experiences so far. It is also a time to draw in communion with the great trees, waters and life all around you. 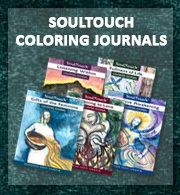 The Gathering offers ample time for personal exploration through Touch Drawing. But we explore a more expansive range of impulses for creating as well. One of the processes we engage, called Inner Portraits, offers a powerful affirmation of how accessible intuitive knowing can be. 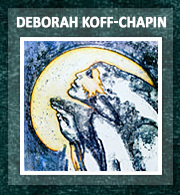 Deborah guides partners into a state of mutual receptiveness. In openness to your partner’s presence, you create a series of drawings. It can be an ecstatic experience to find that images you create have deep significance for your partner. And to recognize specific images from your own life in the drawings created for you by your partner is a precious experience of being ‘seen’. This is a surprisingly easeful process and affirms the access we all have to subtle knowing. No drawing skill is needed! We also have drawing sessions in which we attune to transpersonal levels. One of the ways we do this is a contemplative labyrinth walk. We choose a collective focus for this session. The center of the labyrinth is prepared with drawing materials so that you can draw when you arrive at the ‘stillpoint’. You walk out of the labyrinth carrying your creations. The images that emerge from this session have an expansive, planetary quality. On our final evening together we engage in a deeply integrative ceremonial called the ‘Long Dance’. This is a dynamic group experience that allows each person to engage in improvisational movement, drumming, vocalizing, drawing and witnessing within a shared field of sacred intention. Deborah has been practicing the Long Dance since she was introduced to it in 1977. Read about the Long Dance. This will be a pared-down, essential version. We will dance for 2-3 hours at most. Since we added the Long Dance to the Gathering about five years ago, we have received glowing feedback on the experience. Touch Drawing has powerful applications in therapy, health care, hospice, education, healing, stress reduction, coaching, social work and more. 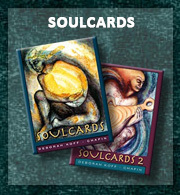 It effortlessly integrates personal, creative and spiritual levels. You may be able to arrange CEU’s through an educational institution. We can provide a schedule of hours and certificate of completion is this is helpful. Though the Gathering is not a facilitator training in the usual sense, the depth of the experience gives you a strong foundation upon which to integrate the process into your work with others. Group discussions focus on issues of facilitation. Small groups will be arranged for mealtime discussions on areas of shared interest. Deborah is available to talk with you about your specific interests during all mealtimes. The closing session focuses on setting intentions for integrating Touch Drawing into your life and work. The Gathering is a transformative experience. Feel free to email with questions or call us at 360-221-5745.